You are here: Home / BLOG / General / Chairs, Chairs, Everywhere! Here at DeeJay’s we have been hard at work this busy season. In between all of the graduations, weddings, baby showers, and birthday parties going on we have also added several new items in to our inventory. This weeks spotlight is on our new chairs! Check out our new kids folding chairs! 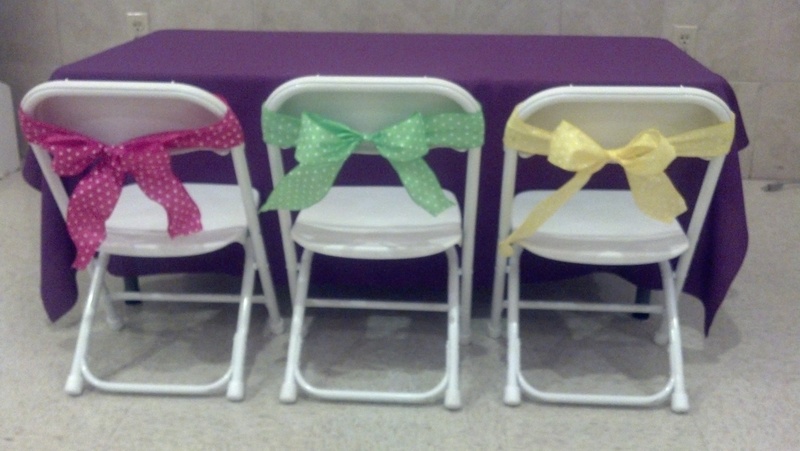 They match our adult standard white folding chairs. On top of being super adorable and just $1 each, these kids chairs fold and stack for easy transportation. Pair these chairs with our kids tables for your next party! http://deejayseventrentals.com/wp-content/uploads/2012-06-01_17-12-35_201.jpg 1840 3264 Lauren http://deejayseventrentals.com/wp-content/uploads/DeeJaysSiteLogo-300x154.png Lauren2012-06-21 14:23:372016-01-24 19:38:26Chairs, Chairs, Everywhere!